70D fine polyester with PEVA lining. Large insulated main compartment with zippered flap closure. 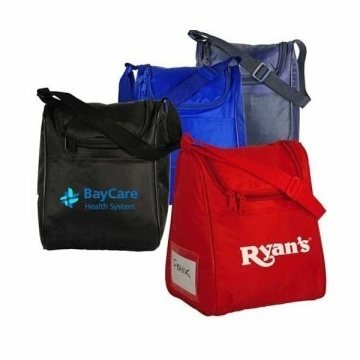 Slide front pocket with Velcro closure. ID holder on the side. Customer very happy with the results. They began using them in their store just after receiving them last Friday. Hope to be able to sell more soon! The logo design looked great without any flaws. the imprint was great. I like how our logo design. It looks great! style. I like the convienence of your website keeping our past orders available for us to reorder the same product. the overall customer service was great. I appreciated it very much.